We’re cut from a different mold. A custom molded rubber product or part is not a generic product or "off-the-shelf" commodity. Different manufacturing processes and different elastomers have different outcomes. Custom molded rubber products and parts may look the same, but poor workmanship or the wrong process or elastomer will result in an entirely different outcome. The product may fail over time due to temperature, fading, tearing, abrasions, chemicals or other factors. The experienced professionals at CMPC will alert you if they see a potential problem with your specifications. Our craftsmanship is guaranteed. Many of our customers have seen the benefits of moving or keeping the fabrication of their custom molded rubber products here in the United States rather than overseas. 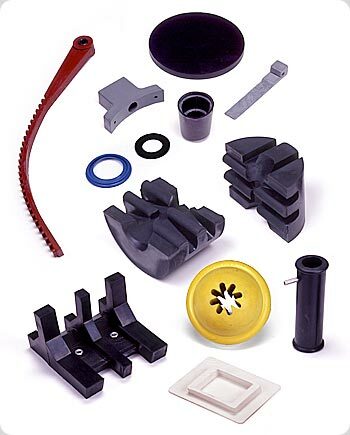 The quality of CMPC’s custom molded rubber products and parts are unassailable and guaranteed. You have complete control in this country—there is no communication barrier if a problem arises, and our raw rubber materials are a known quality. What’s more, shipping is within our own borders so there is no chance of customs or import issues. Best of all, your custom molded rubber parts will be MADE IN AMERICA. Our product list is long and diverse since our molded rubber parts are custom. They are used within many different industries, from A to T, Agriculture to Transportation. They are often one of a kind, everything from large, heavy-duty rubber bases or anchors to tiny O-rings used in medical devices, seals, valves, bushings, diaphragms, connectors, inserts and much more, including consumer products. Colorado Molded Products Company puts more then 200 years of combined experience into every part. Our long-time employees, many with 20+ years, know rubber, synthetic polymers, and elastomers—how to mold them, bond them, finish them and deliver the molded parts on time, so they meet or exceed your specifications. Our custom rubber molding services and custom rubber production capabilities are what keeps our loyal customers coming back for new orders and re-orders, and make first-time customers happy that they found us. Got more questions than answers? Need help deciding on the process or elastomer? Have concerns about cost and scheduling? Design issues interrupting your work flow? Contact us. We’re here to help. Call Chris Webb at ​800-875-5805. © Copyright 2015, Colorado Molded Products Company. All rights reserved.